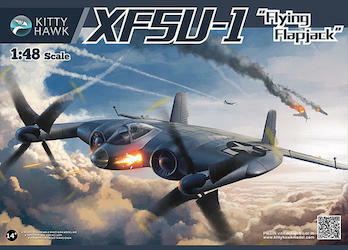 The Modelling News: In-boxed: Gary reviews Kittyhawk’s 48th scale Vought XF5U-1 "Flying Pancake"
The Vought XF5U-1 "Flying Pancake"
You just never know what's going to be next on the Kitty Hawk Model release schedule. 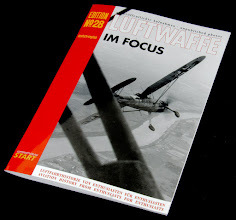 They certainly are jumping all over the place with the subjects being offered, not that it's a bad thing mind you. 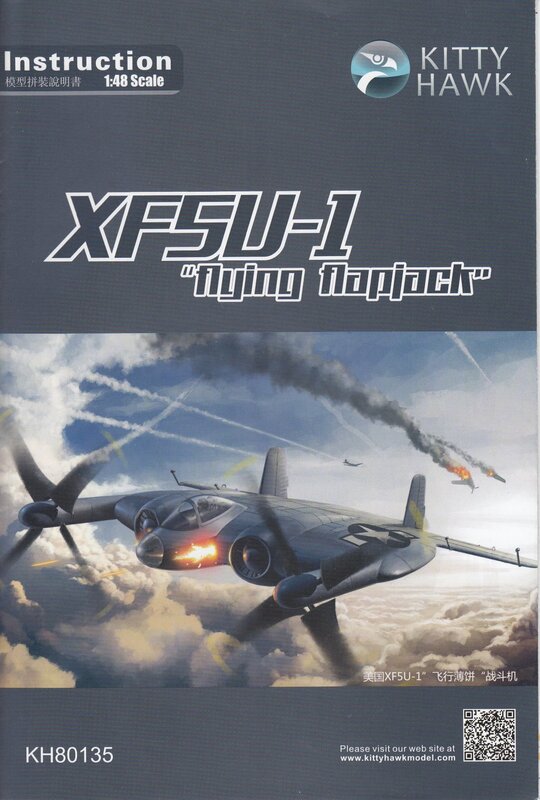 I doubt the XF5U-1 Flying Pancake will be one of their big sellers but for those of us who like to try something a bit off the beaten track it's a welcome addition to the KH line-up. 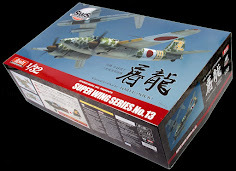 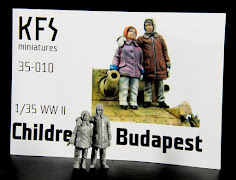 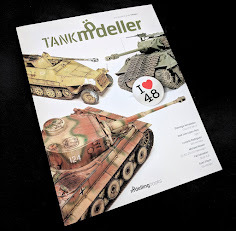 In 1:48 the kit is still very small and with such a small parts count will be a quick and simple build. 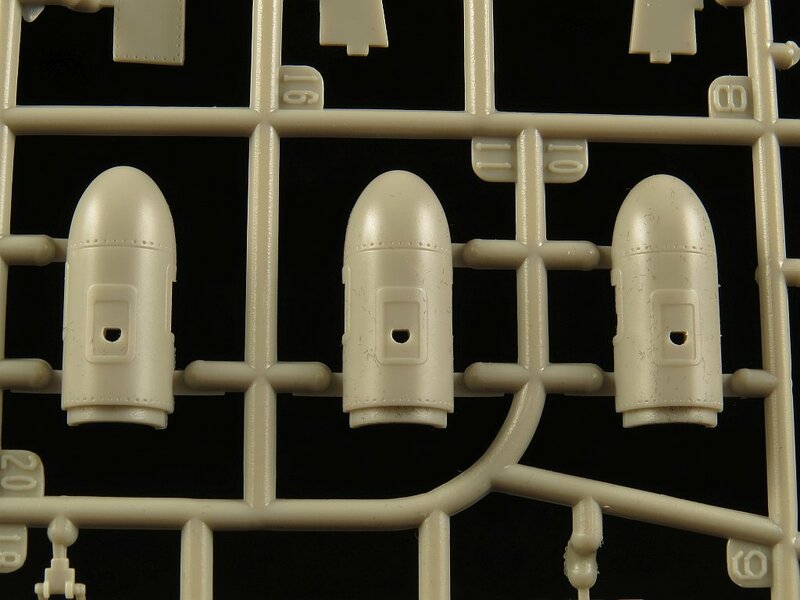 1 x clear sprue containing the canopy & clear nose cone. 2 x decal sheets providing a total of 3 markings options. 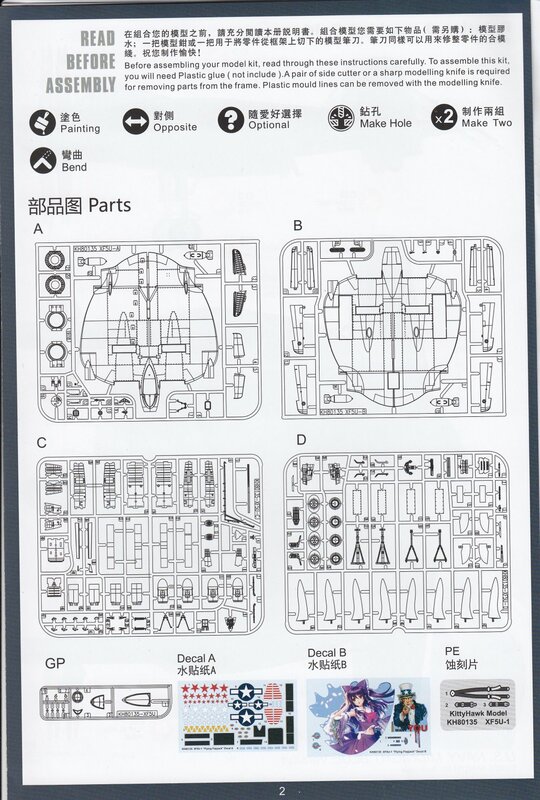 The second sheet (Decal B) has had the intended 'Anime' artwork removed as it seems that KH could not work out a licensing agreement in time. 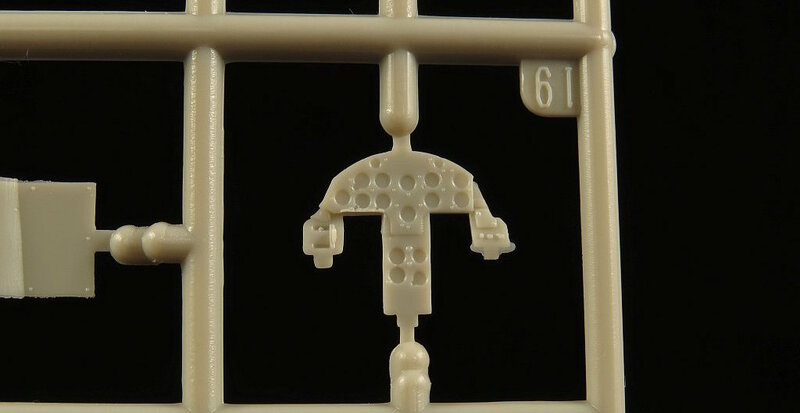 1 x photo etch brass fret containing seat belts. 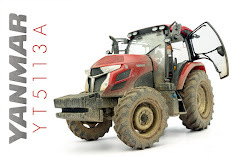 1 x printed assembly/painting manual with black & white instructions and full colour paint & markings. The afor mentioned 'Anime' color scheme is part of the book but those pages have been glued shut. The XF5U discoidal aircraft was an invention of Charles H. Zimmerman, who conceived the design in the early 1930s. 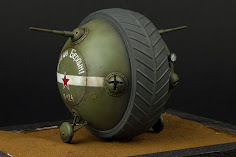 He won a 1933 National Advisory Committee for Aeronautics (NACA) design competition with a disc-shaped concept capable of flying at high speeds or hovering; NACA rejected further development because they thought the design was "too advanced". 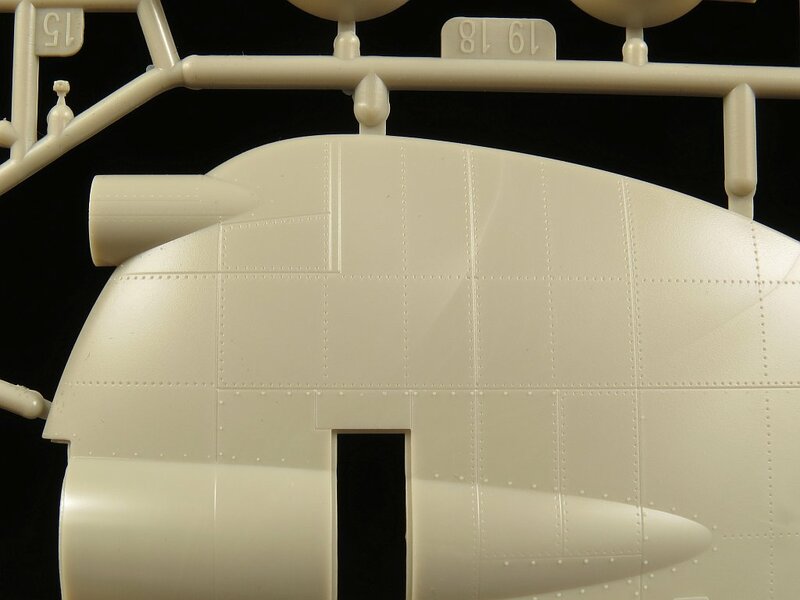 Zimmerman joined Chance Vought Aircraft in 1937, and there was able to produce an electric powered model of his design, designated V-162, flown by remote control in test situations, tethered in a hangar. 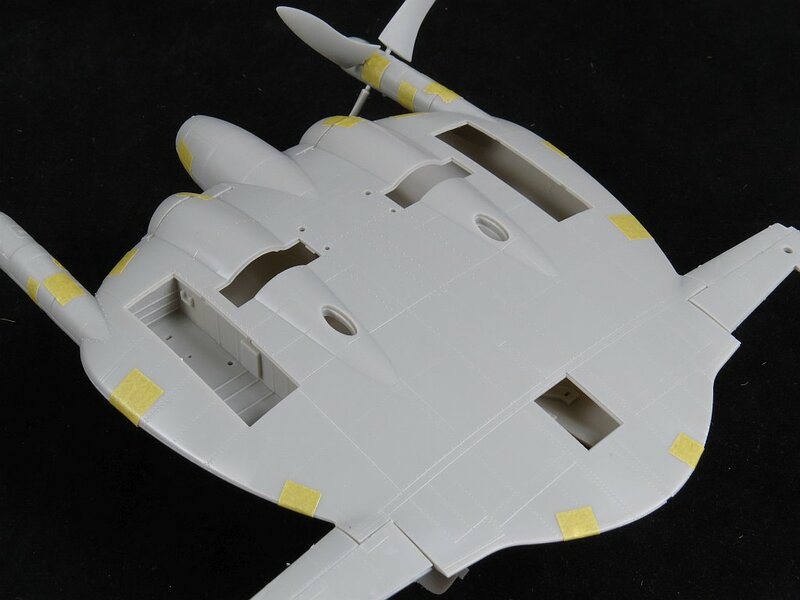 The rear fuselage was hinged to act as an elevator. 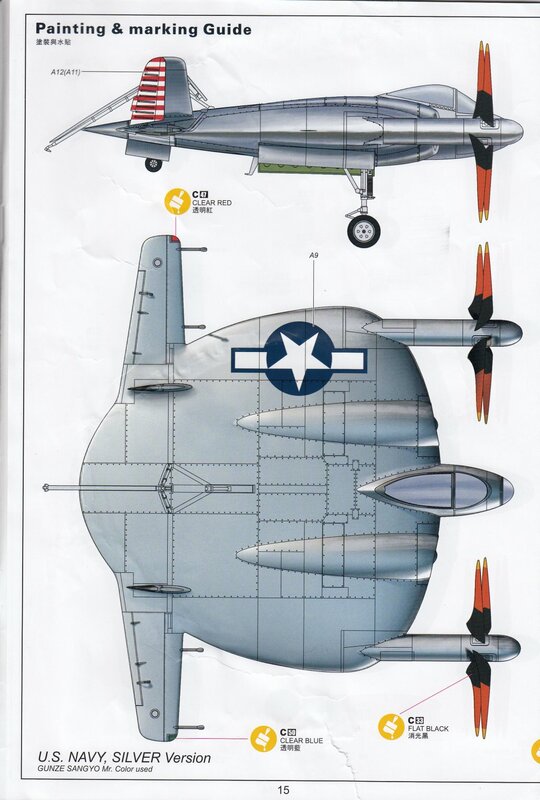 Zimmerman provided an original blueprint to the US Navy (featuring no horizontal stabilisers) in March 1939. A month later, the Navy asked NACA (which later became NASA) to investigate the proposal. 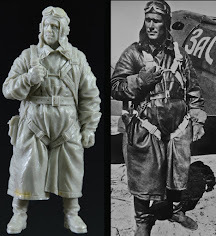 In October 1939 manufacture by Chance Vought of a small scale model for wind tunnel testing was approved. 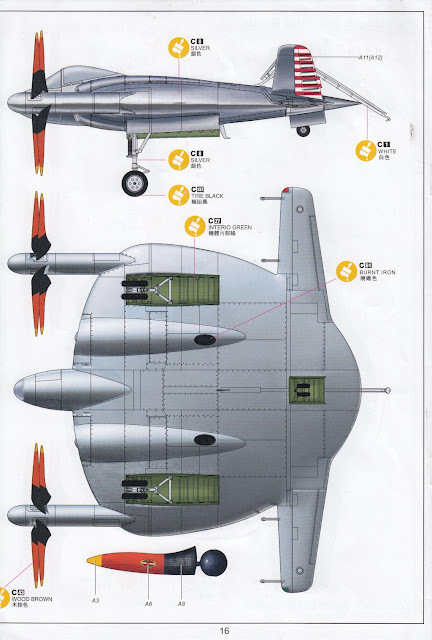 The design was referred to as V-173. 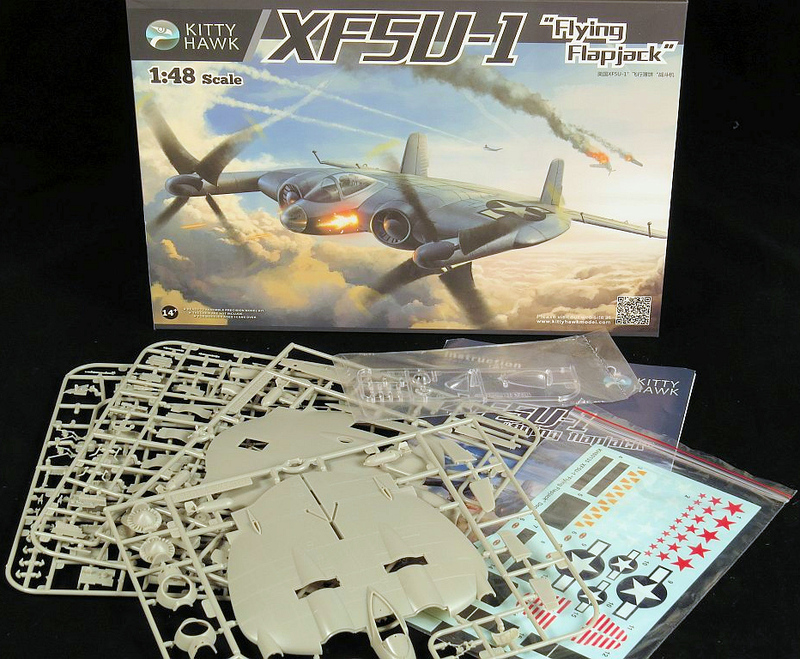 Call it what you may, "Flapjack", "Saucer" or "Pancake", it had no official name, but Vought's last propeller-driven fighter would certainly answer to "weird." The "flying saucer" which thousands of Americans saw in the sky in 1943, near Stratford, Connecticut was no extra-terrestrial visitor or mysterious UFO; it was Vought's Model V-173 making one of its 200 or more test flights with Boone T. Guyton or Richard Burroughs or even, on occasion, Charles Lindbergh, at the controls. 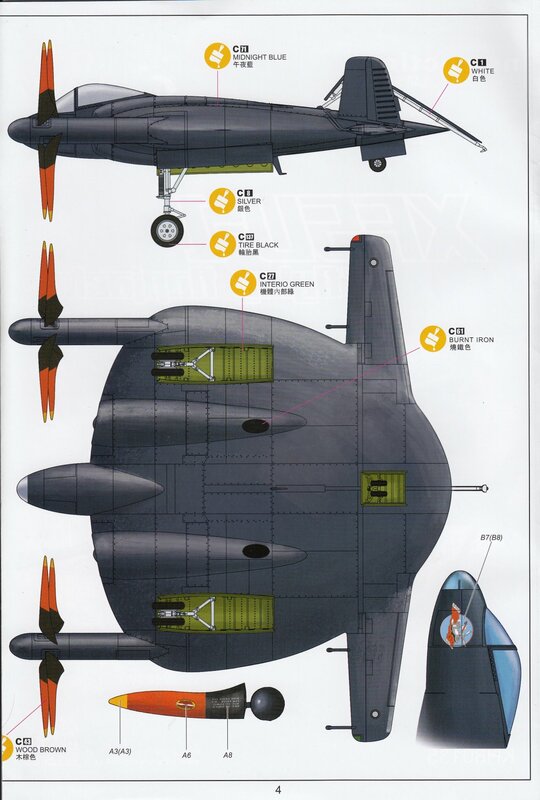 This was one of the strangest looking flying machines to take to the air since the early pioneering days, but was actually a revolutionary new plane which was built as an experimental fighter. The V -173 proved to be virtually stallproof. 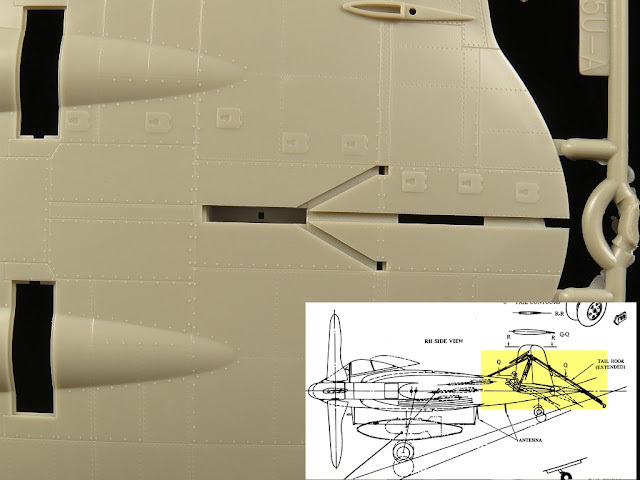 At no time would the plane ever stall or spin during the tests, no matter how tight the turn. 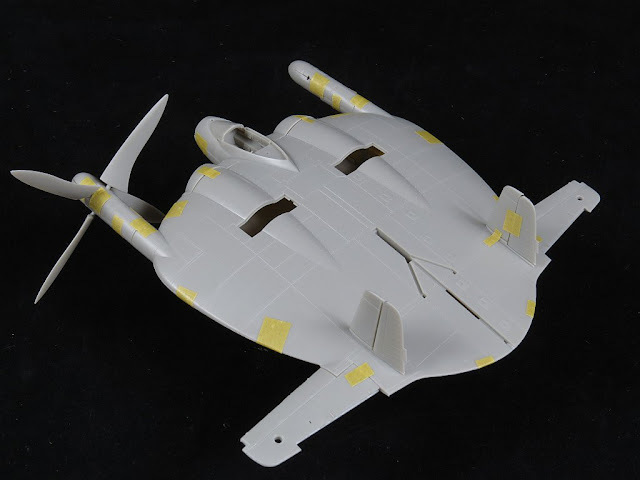 Maximum speed of the craft was 138 mph and it could climb 5,000 feet in 7 minutes. 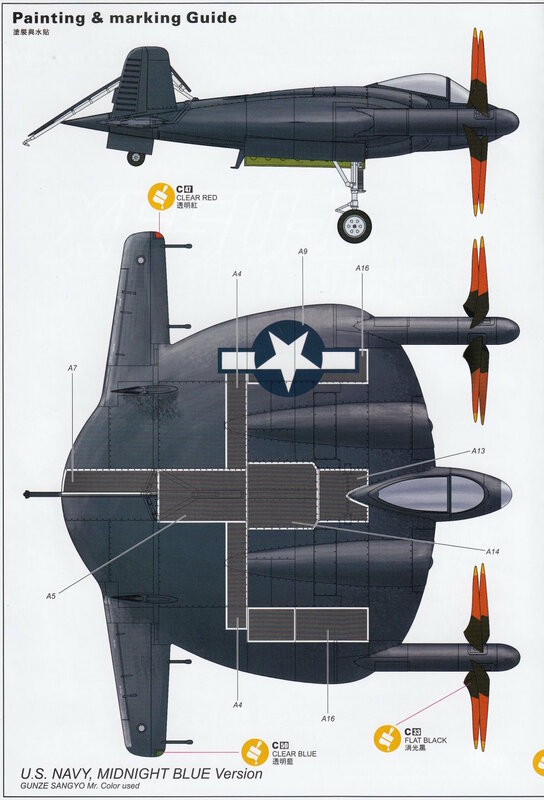 The specifications for the XF5 U-1 fighter were truly exciting considering the performances being achieved by the typical 1942 fighter. 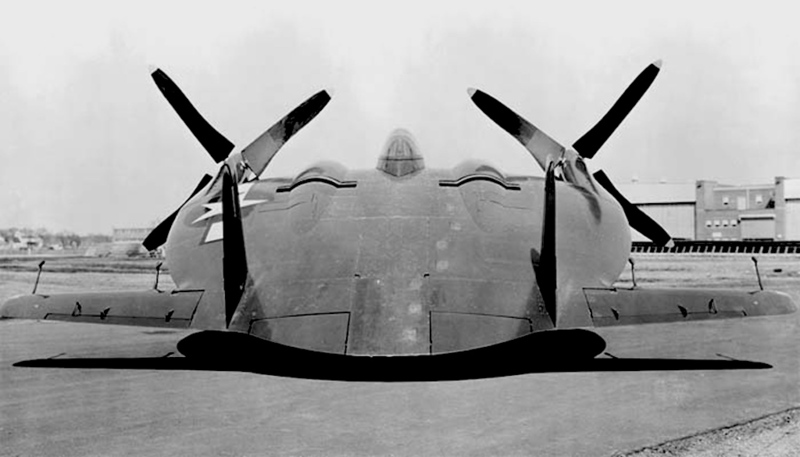 With a pair of 1,600 hp Pratt & Whitney R-2000-7 air-cooled water injected engines, the maximum speed was to be 460 mph while the landing speed was to be as low as 20 mph. Projecting even further, a pair of gas turbines could provide a speed of 550 mph while landing at near zero ground speed. 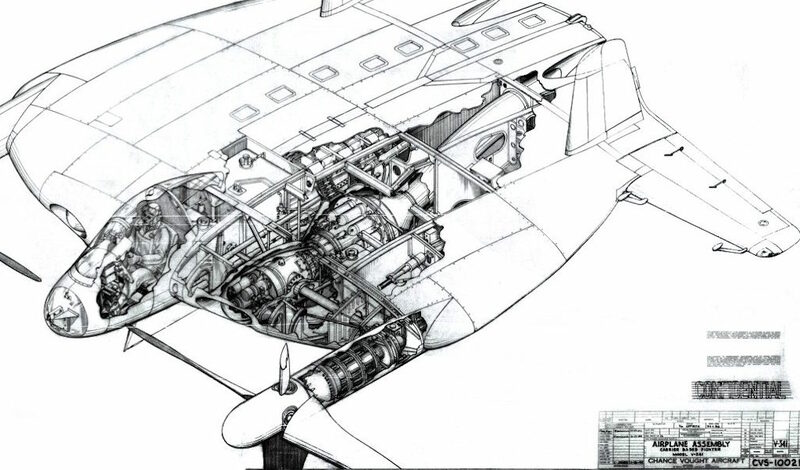 With the turbine powerplant, the XF5 U-1 would actually hover motionless in the air, hanging under its props like a helicopter. 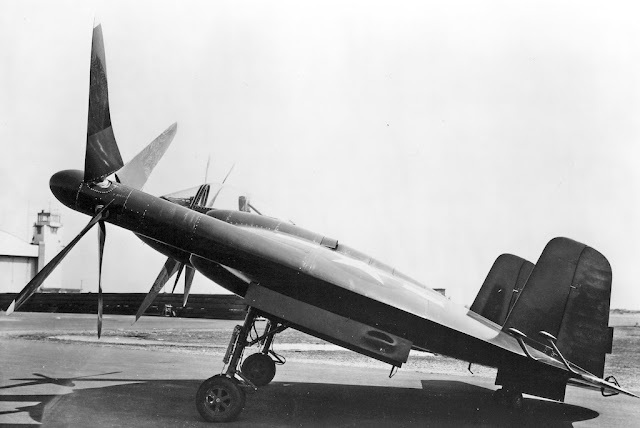 The Navy ordered two all-metal XF5U-1's as the V-173 flights proceeded. One was to be used for static testing while the second would be used for flight evaluation. 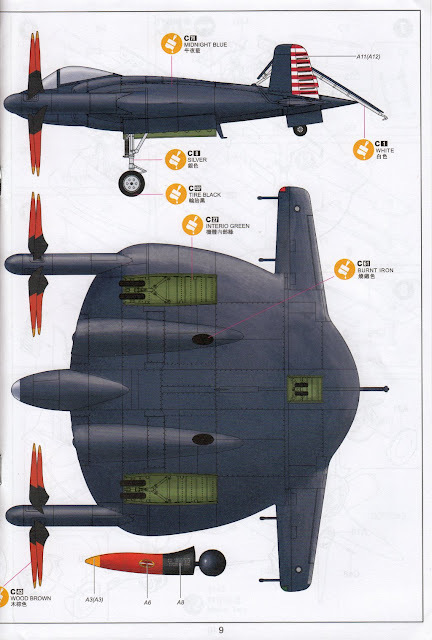 Unfortunately, although the XF5U-1 was shipped to Muroc, California, for tests, it never flew. 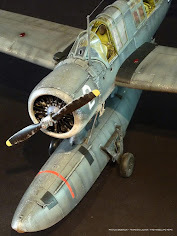 The jet age made propeller-driven fighters a thing of the past and the XF5U was scrapped by the Navy having never left the ground. 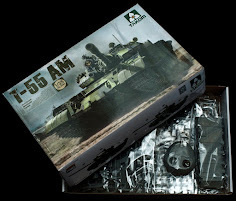 To me, the fit of a kit is one of the most important aspects in determining how well the manufacturer has done their job in engineering the model. 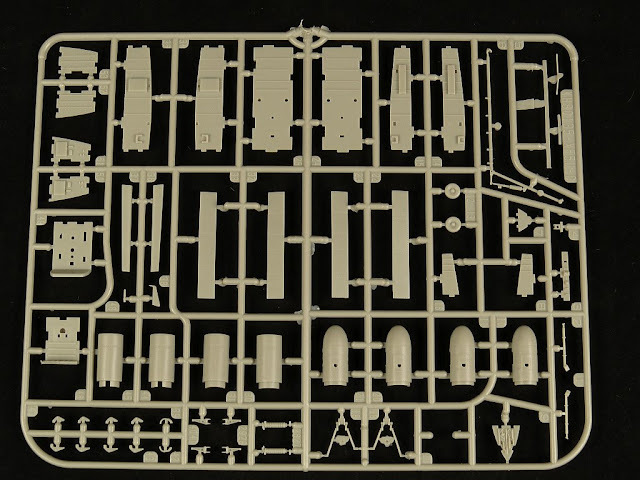 You can inspect the sprues, make educated guesses about how the kit will go together but nothing beats actually cutting the parts off and testing them. 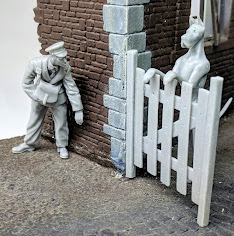 I am a big advocate of dry fitting (holding the parts together with tape rather than glue) as it gives me a real sense of how the model should best be assembled and which parts need extra attention. 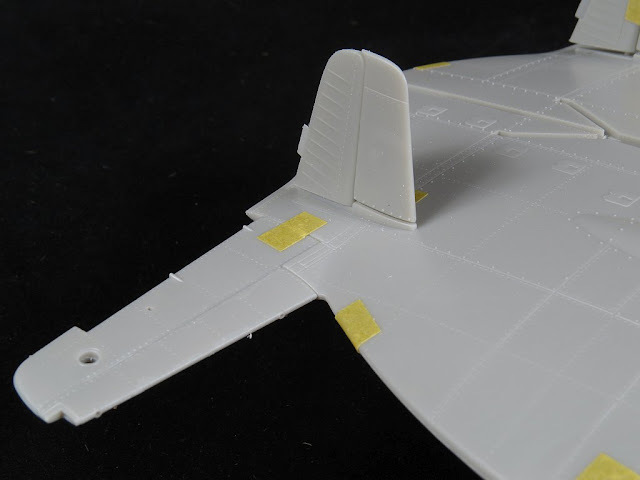 Sprues A & B are dominated by the fuselage/wing upper and lower parts. 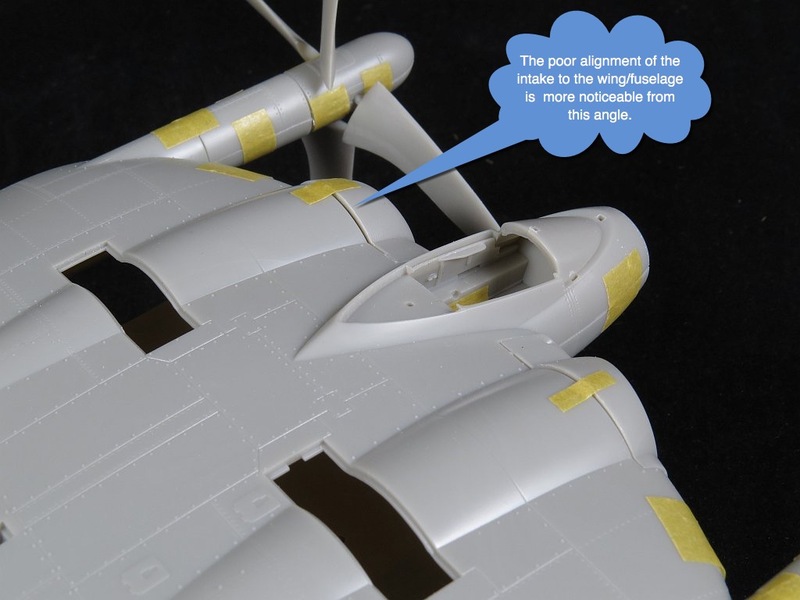 Surrounding these main parts are the rest of the airframe (such as it is) with the vertical and horizontal tails and engine intake covers. 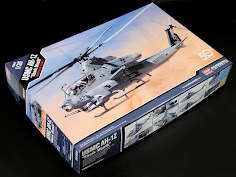 The level of detail is on par with Kitty Hawks previous releases that I have either reviewed or built. 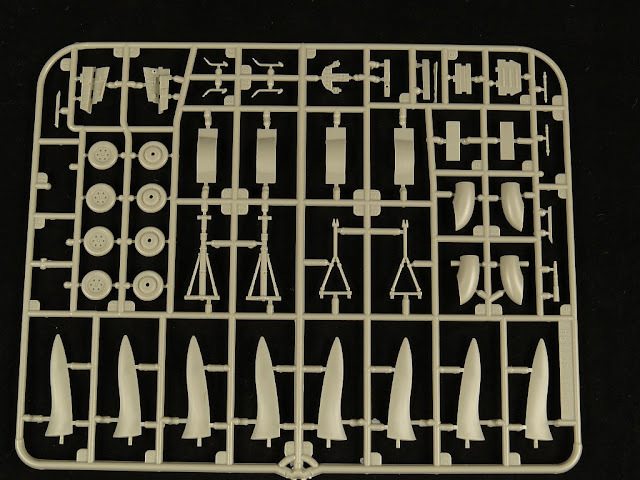 There is no visible flash and parts are connected with reasonably sized sprue join points making cutting parts off that much simpler. 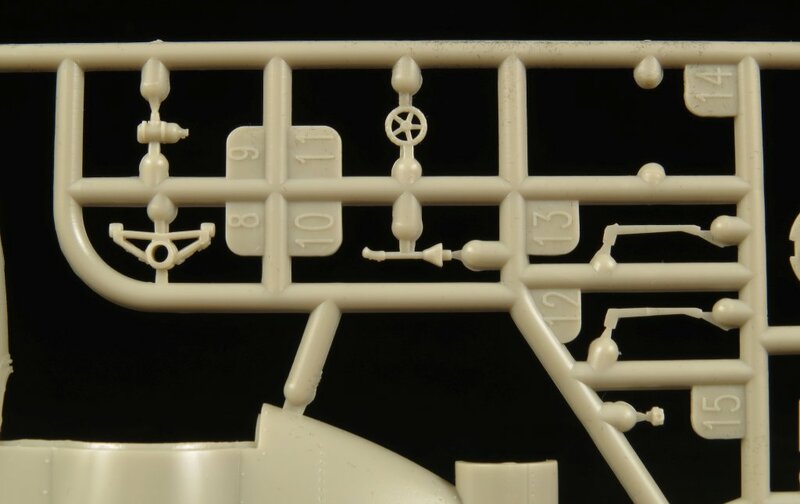 Probably some of the smallest parts found in the kit are for the cockpit. As you can see here the parts are well moulded and should be easy enough to remove and clean up during construction. 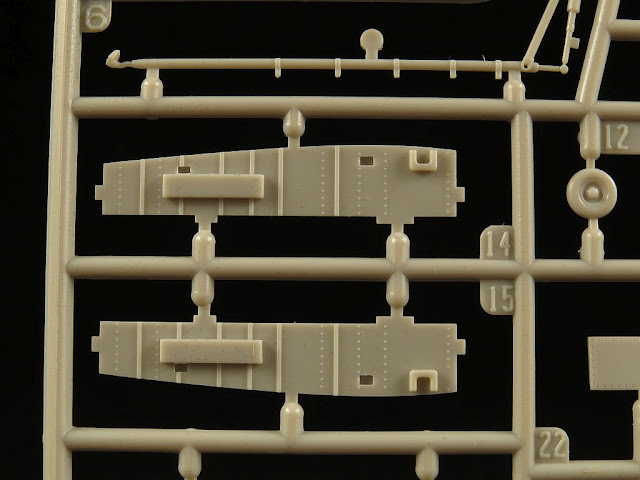 Kitty Hawk have added both raised and recessed rivet detail to the surface of the model. 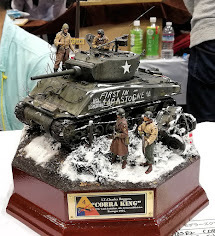 This is very nicely done. 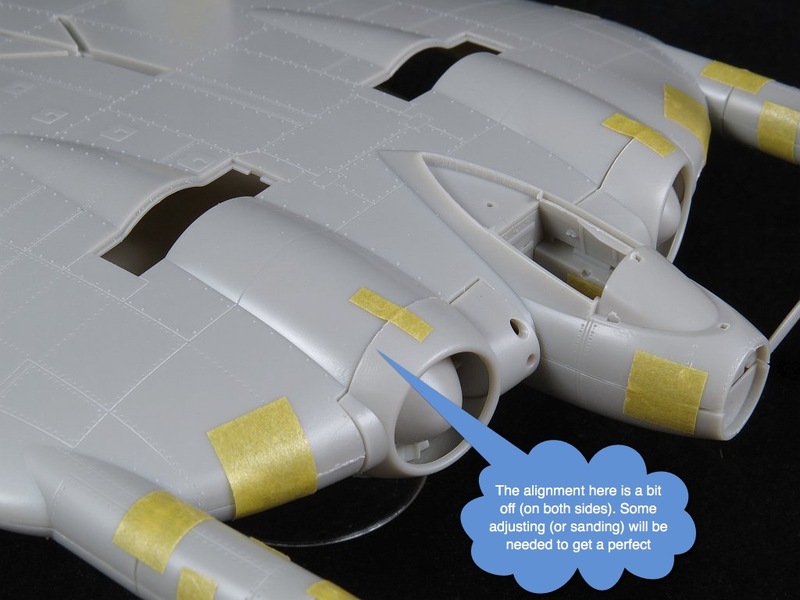 My only concern lies with how much of the raised detail will be lost when sanding around poor fitting joints like the one we saw in the dry fit for the intake to wing join. Rectangular engine access panels are also provided on the wing upper and lower parts. Unfortunately, no interior engine detail is provided so unless you plan to add you own P&W R-2000 engines these panels will be best left closed. 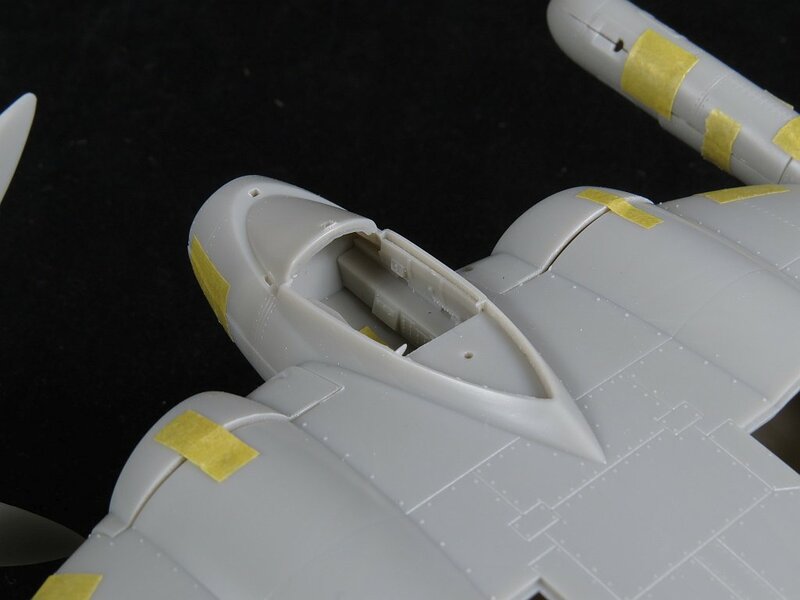 One of the more interesting features of the model is the inclusion of the arresting hook (which is stowed on the top of the fuselage rather than below it.) 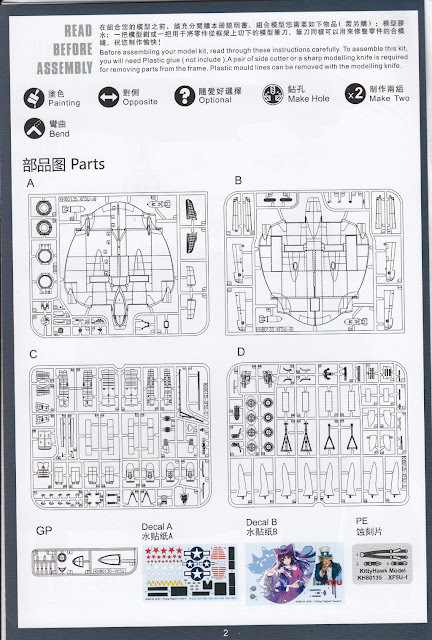 I'm not sure how accurate these parts are because I could not find any actual photos of the two XF5U's with such a hook fitted but there are Vought line drawings that show how the hook was designed to operate so I my guess is that KH based the parts off these. The recessed rivet detail on KH kits are normally a little on the soft side for my liking. I usually take the time to go over the model surface with my riveting tool and sharpen up each rivet (yes it takes a while but it’s worth the effort when it comes time to do that panel wash later on). 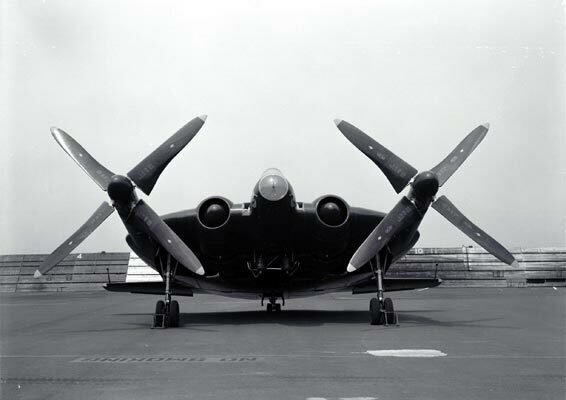 At first glance you could be forgiven for thinking the XF5U was powered by jet engines (which drove propellers). The air intakes (and the under wing exhausts for that matter) give little or no hint that in fact buried inside the wing are a pair of 1600hp Pratt & Whitney R-2000-7 air-cooled radial engines. 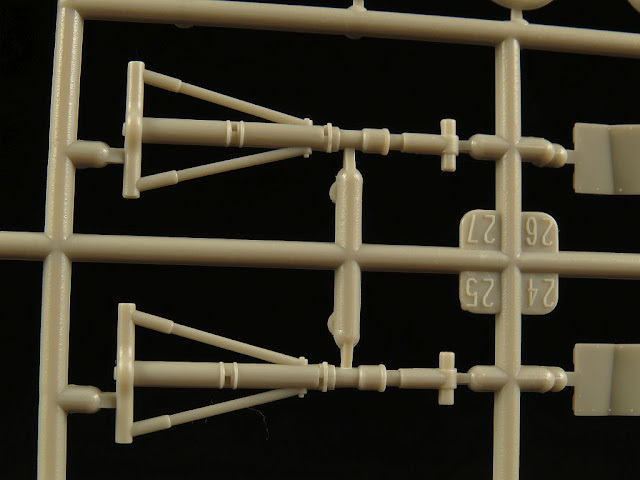 This is the first KHM kit I have reviewed that has raised rivets and they look well done. 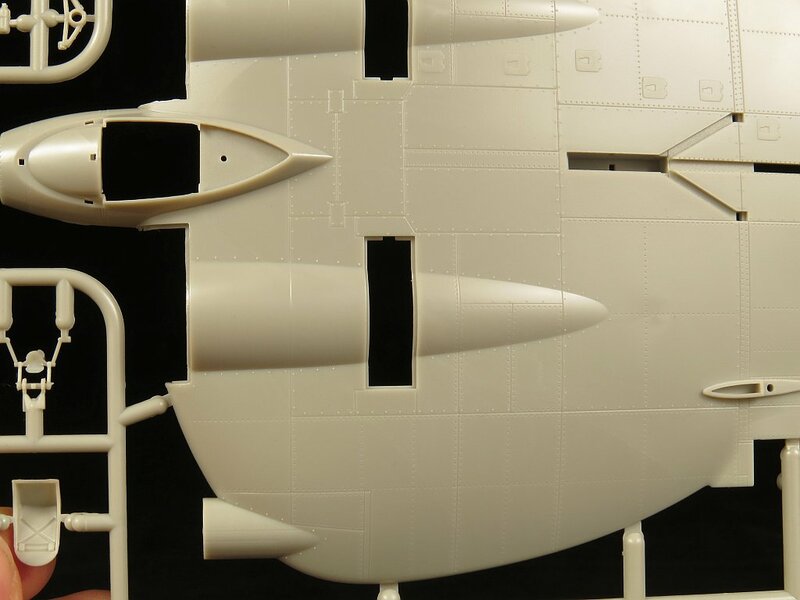 I'm a bit concerned that some of these will be lost due to sanding especially around the engine access panels on both the top and bottom of the wing. 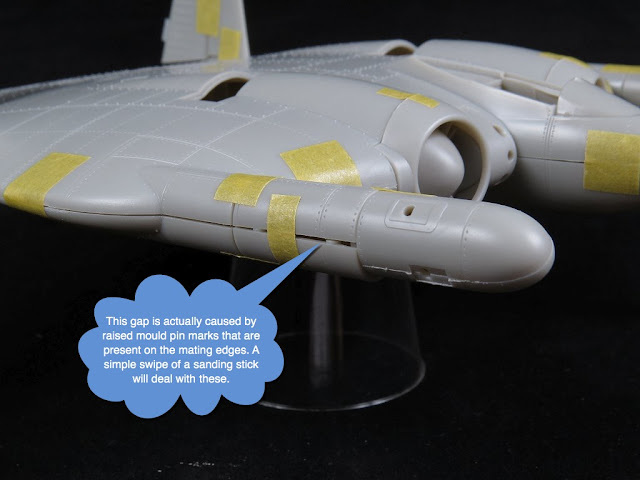 This is somewhat disappointing as I really don't see the point of putting open access panels on a model if you aren't providing any internal detail to go behind them. 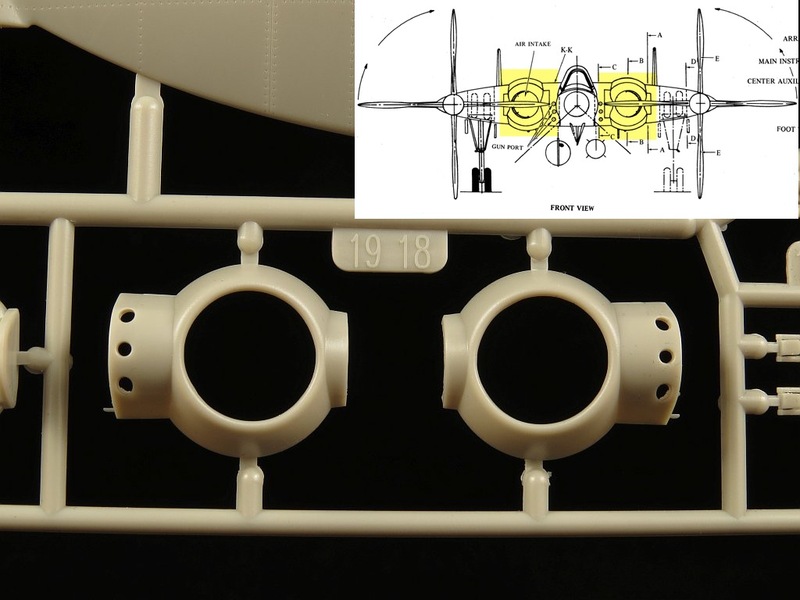 Sprue C covers the two main wheel wells, the tail wheel well, undercarriage doors and the distinctive extension shafts for the propellers & spinners. 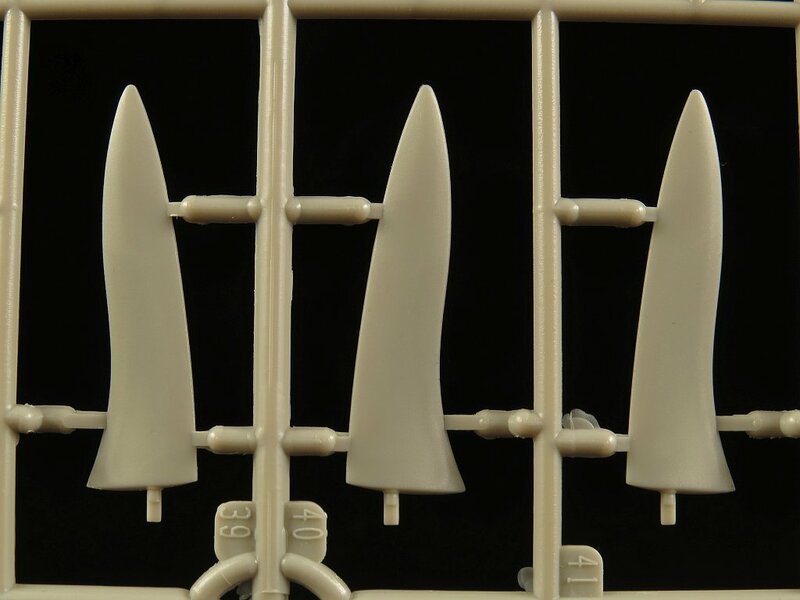 The unusual tailhook is moulded in a single piece. KH seem to have refined their moulding techniques resulting in noticeably smaller sprue attachment points on all parts. I'm not sure what (if any) references KH used for areas like the wheel well interiors but as I'm not super concerned about such things on a model I believe that what they have provided looks convincing enough to my eyes. 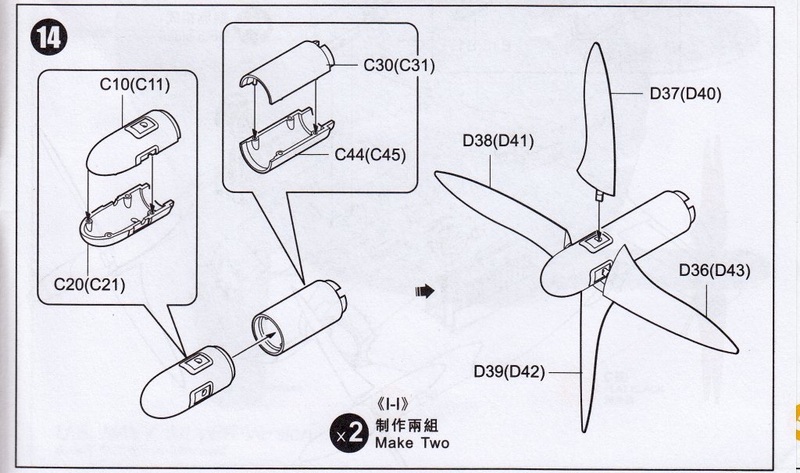 One area that needs some assembly is the propeller shafts. 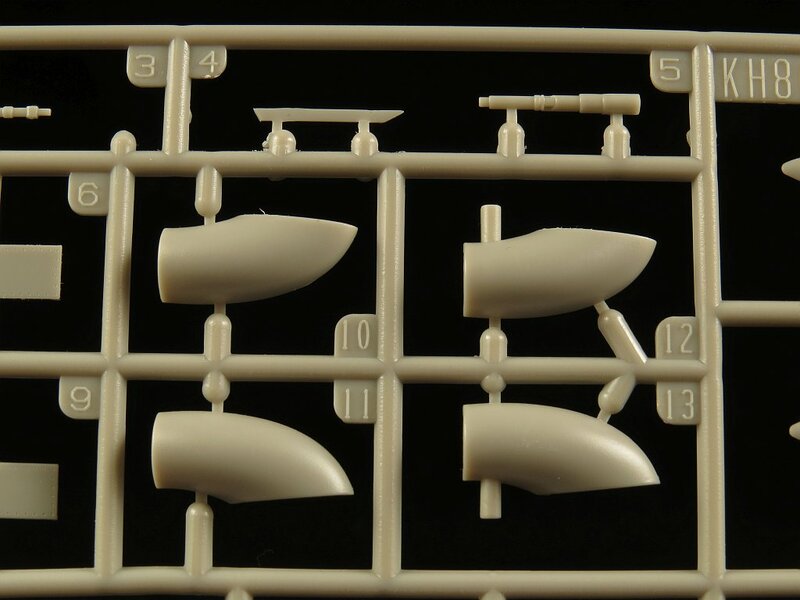 Each side consists of 4 parts to make up the shaft body and spinner body. The surface panel lines and rivet detail will benefit from some sharpening (with a scriber or rivet tool) if you plan to apply a wash to the surface detail after painting. 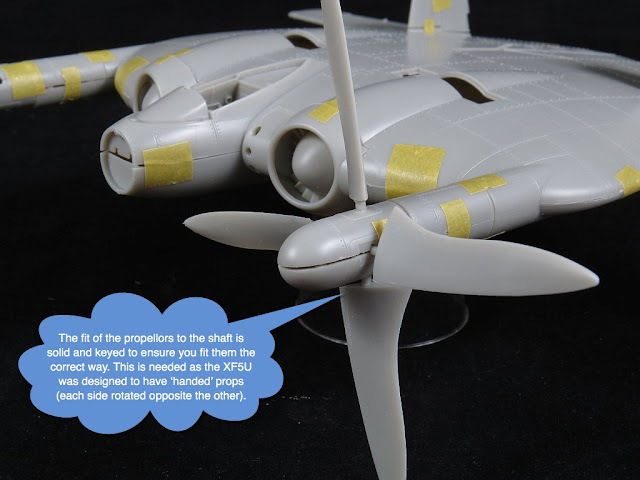 The propellers on the XF5U-1 were 'handed'. 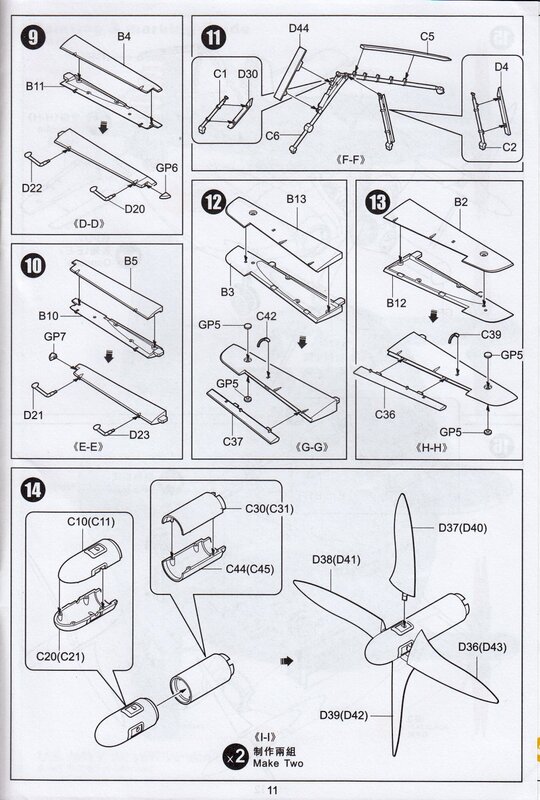 This means each side rotated the opposite direction to the other. 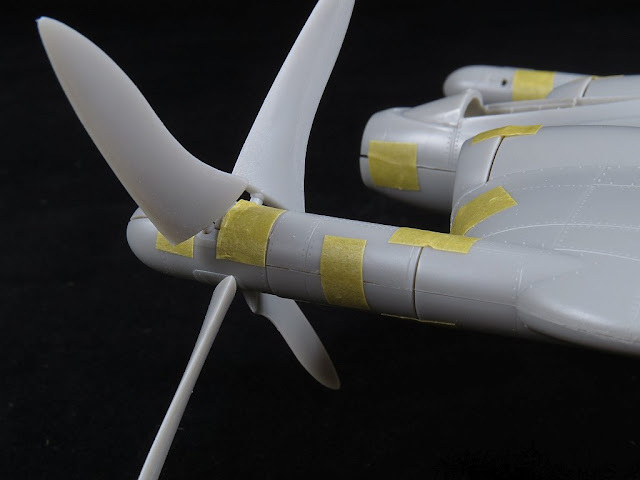 As a result, the propellers themselves need to be oriented correctly on our model. 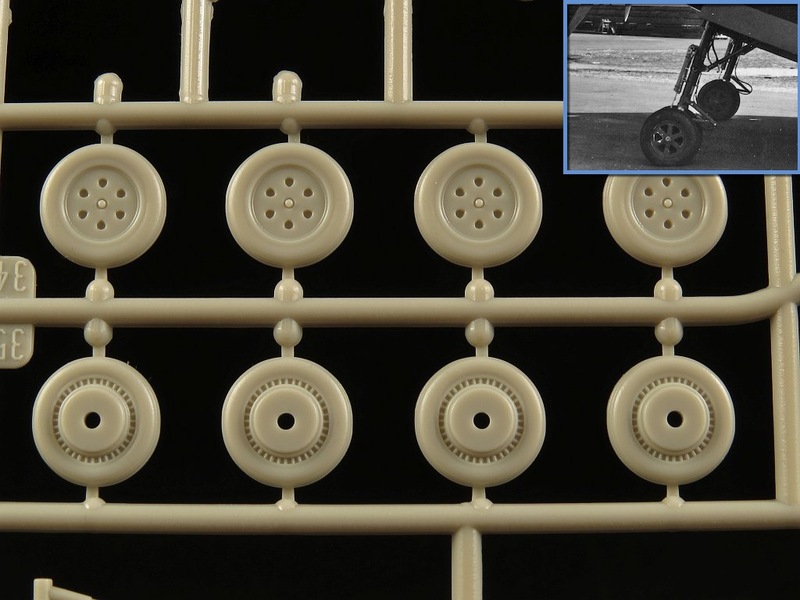 KH have provided keyed mounting holes on the spinners to ensure the props cannot be inserted the wrong way round. 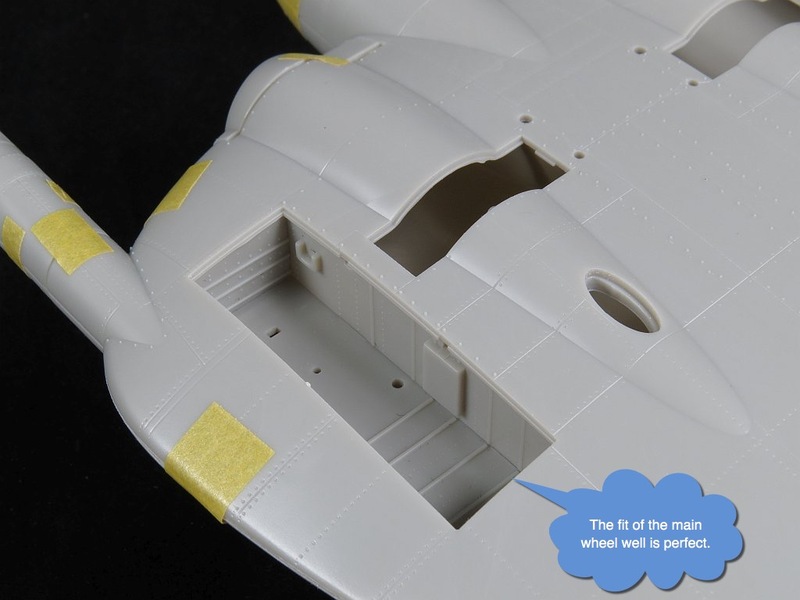 The main gear doors are fairly simple but adding some basic detailing to the interior like this is always welcome as it adds interest to the underside of the model. 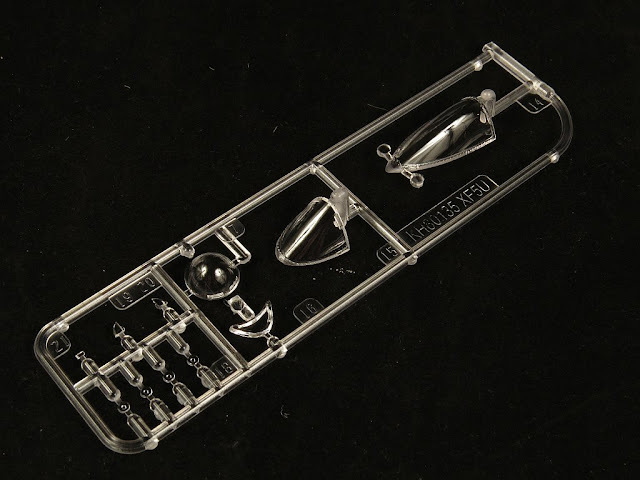 Sprue D rounds out all the plastic parts in the kit. 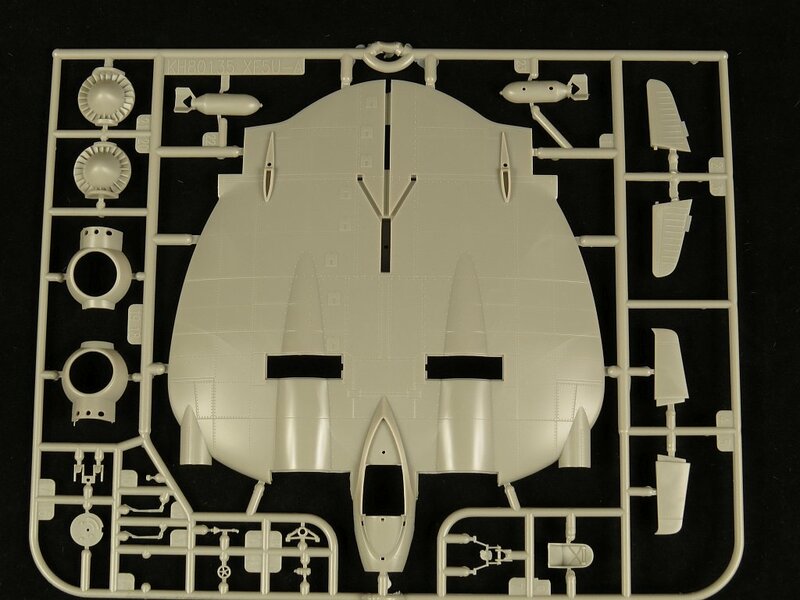 On this sprue we have the cockpit interior, the main undercarriage struts and wheels, the engine exhausts (again which look way more like a jet exhaust) and finally the eight propellers. The XF5U propeller blades were specially constructed of wood and mounted in two vertical planes. Each propeller blade was articulated and could tilt fore and aft of its connections on the shaft. 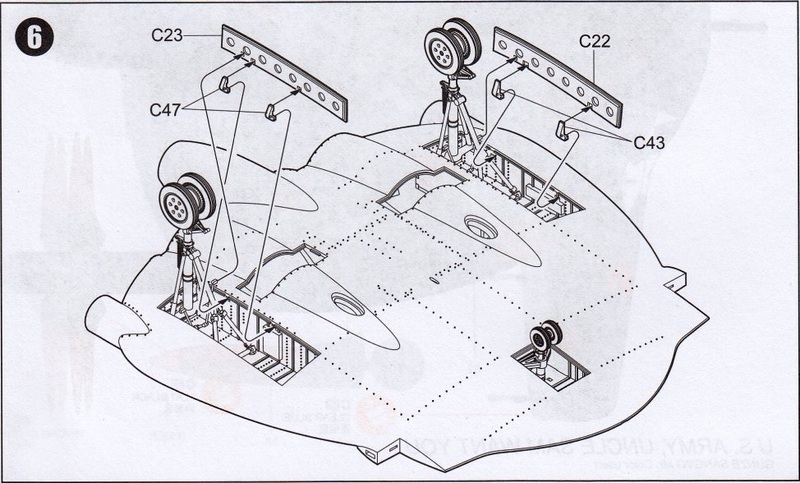 This is similar to the movements of the rotors on a helicopter, to which the XF5U-1 seemed a second cousin. The propeller blades were black from the root with white stencilling, then varnished mahogany with yellow tips. KH seems to do a reasonable job of capturing the shape of the blades. The exhausts on the XF5U look more like jet nozzles that something you would expect from a piston powered combustion engine. Nevertheless, Vought combined the exhausts from the radial engines and they exited the aircraft interior on the underside of the fuselage. 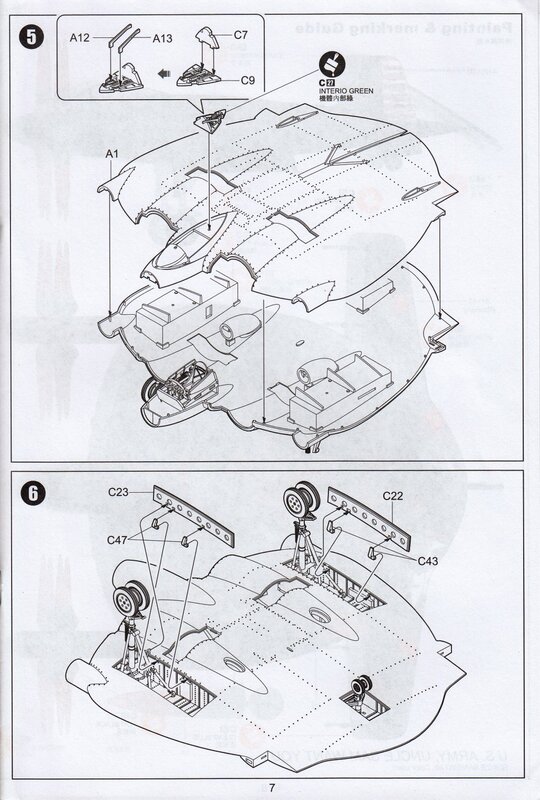 The main undercarriage struts housed two main wheels per side. 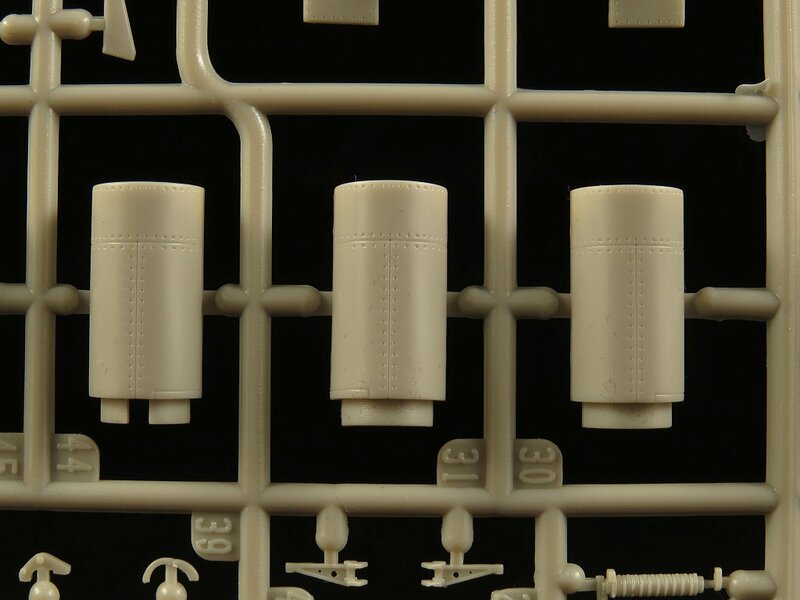 These parts look to be well moulded with minimal clean necessary before assembly and paint. 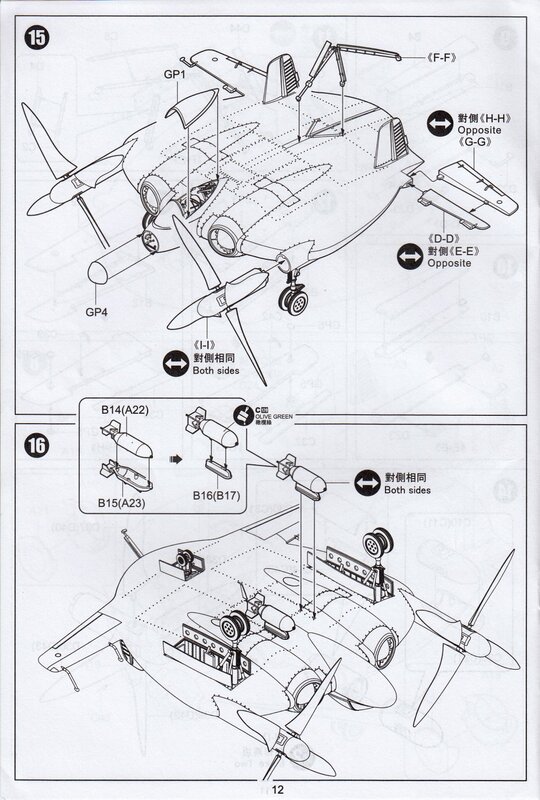 This clear period photo of the XF5U-1 affords us some useful information for detailing our model. Note the rivet detail on the propeller shafts and hubs as well as the hydraulic piping lines on the main undercarriage. 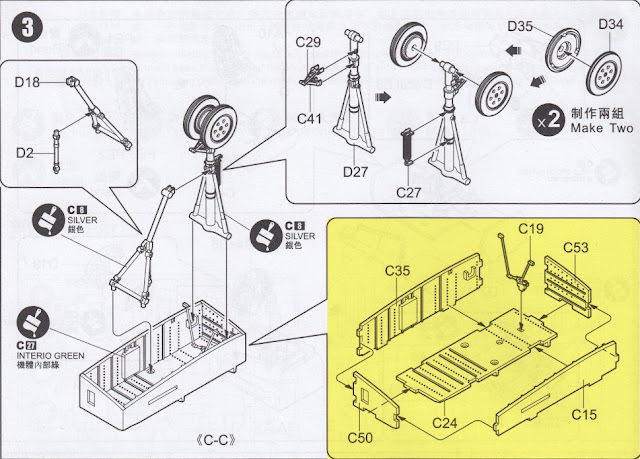 The kit wheels look convincing enough with the exception of the hubs. 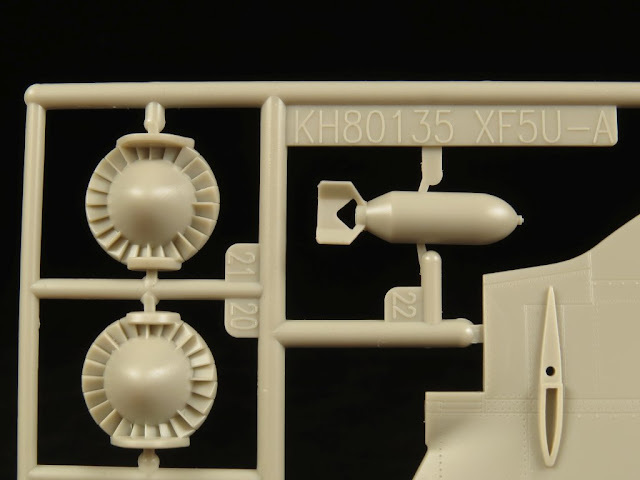 The XF5U main wheels look very similar to those used on the F4U Corsair and unfortunately the hubs provided by KH bare little resemblance to XF5U photos. I'd be inclined to discard the KH wheels and use some resin replacements from an F4U kit. The cockpit of the XF5U was simple enough. 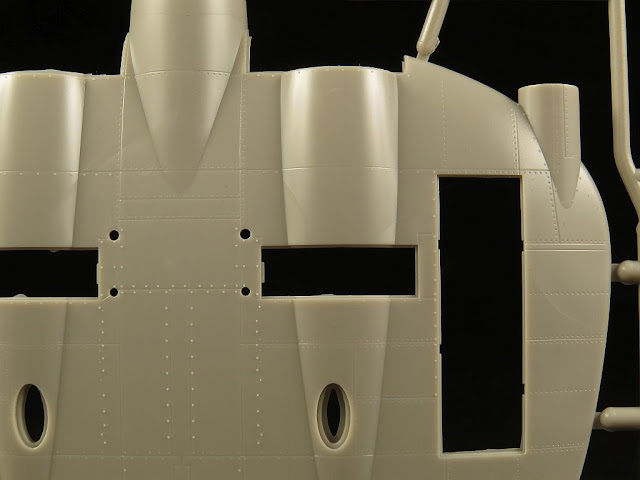 KH provide the main instrument panel with raised detail and recessed instrument faces. 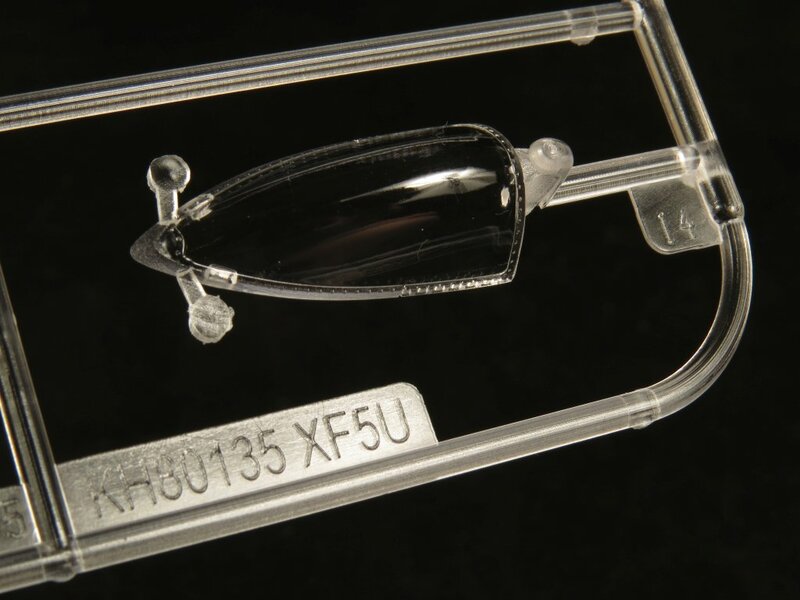 A single piece decal is provided for the main IP and with a generous application of decal softening solution should settle down well over the raised plastic detail. 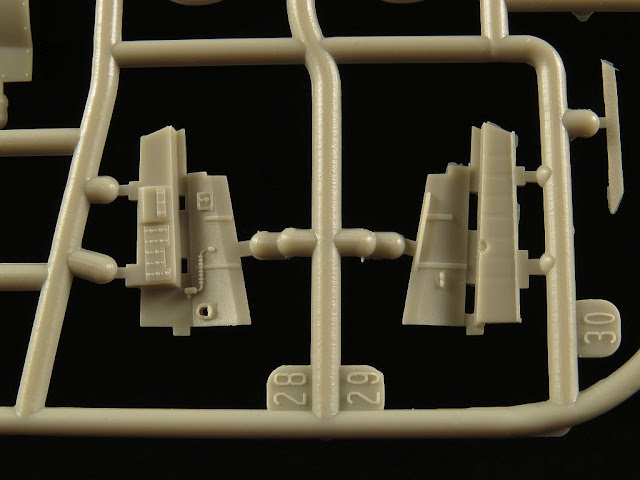 Cockpit sidewalls have moulded on detail which is pretty typical (and acceptable in my opinion) for 1:48 scale. 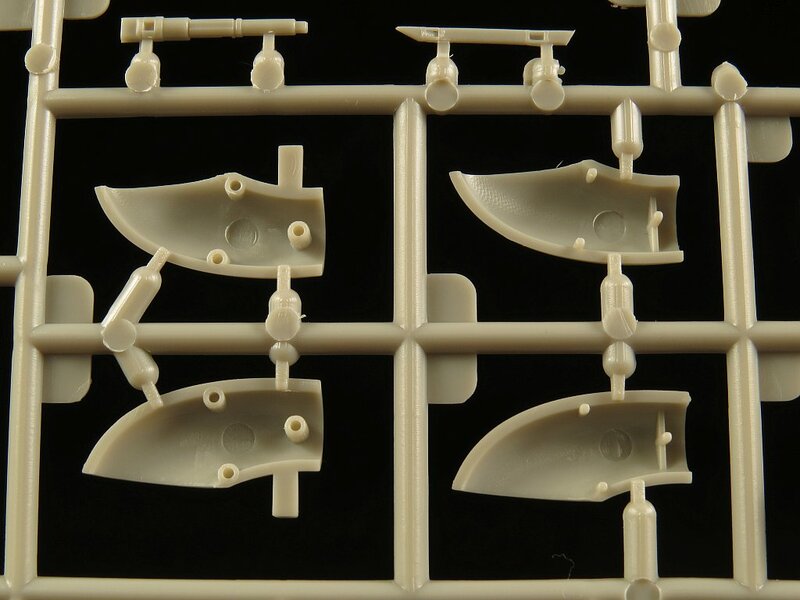 Sprue GP rounds out the plastic parts. The canopy and windshield, nose cone and navigation lights are all contained on this small sprue. The clear parts all moulded well and clear of any blemishes. No mould seam lines need to be removed here as the canopy shape does not require them. 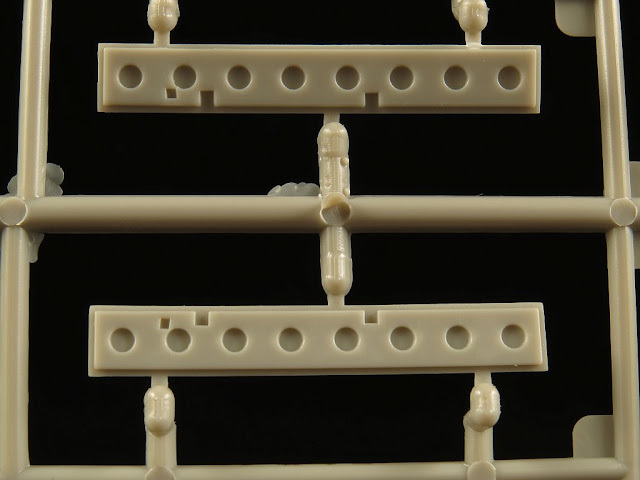 One thing I'm always more conscious of with clear parts are the size and location of the sprue tree attachment points. 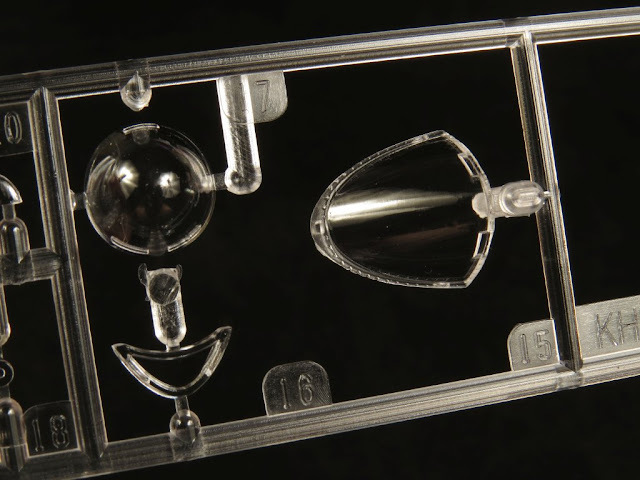 Unlike normal plastic parts that you can easily repair if the sprue separation goes awry, clear parts are not so forgiving. 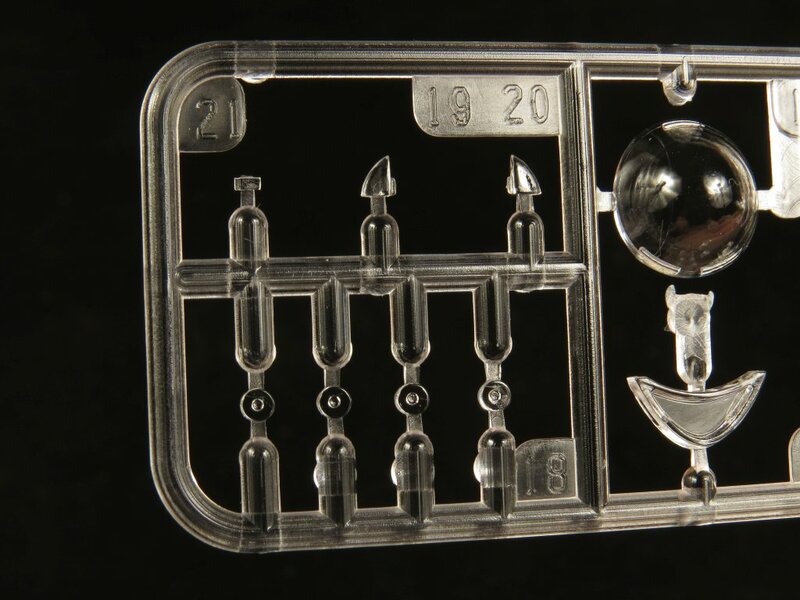 A small photo etch brass fret is included containing a set of seat belts. 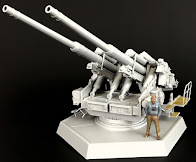 These look to be adequate for the task. The decals provided by KH are visually in register and offer solid color saturation. 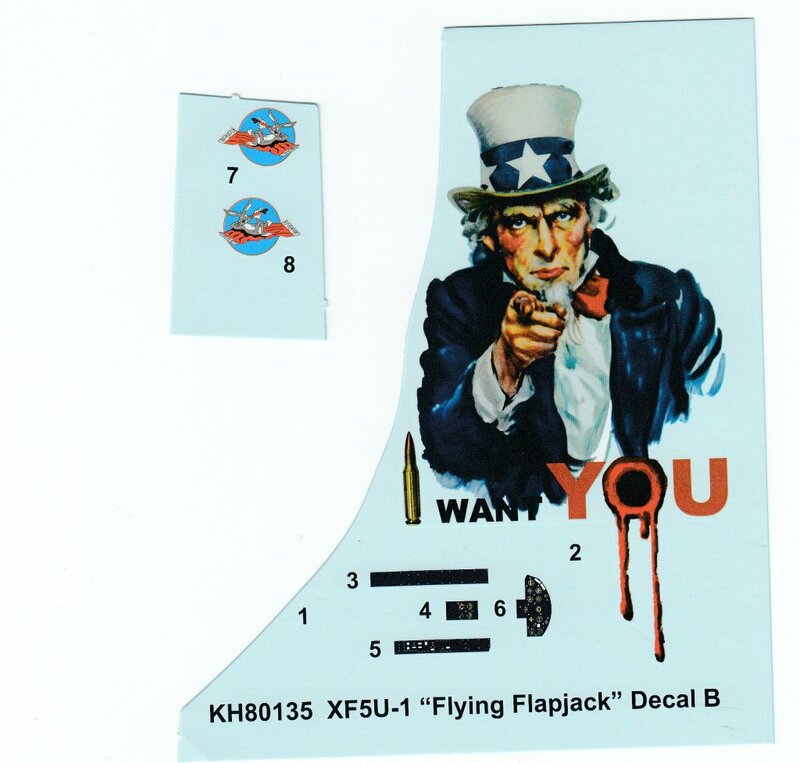 I have only used KH kit decals once (on my MiG-25 build) and from memory they performed well enough. 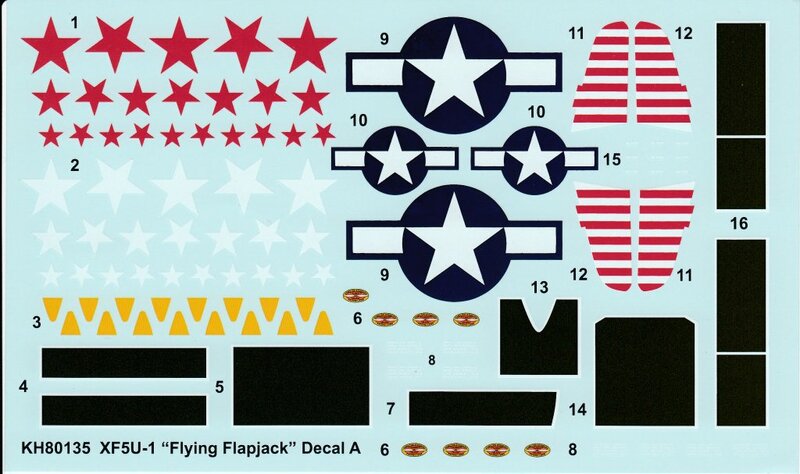 I really doubt that anyone will be coming out with aftermarket decals from this subject (unless they do a what if sheet). 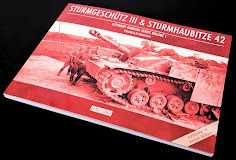 The second sheet comes cut as shown here. 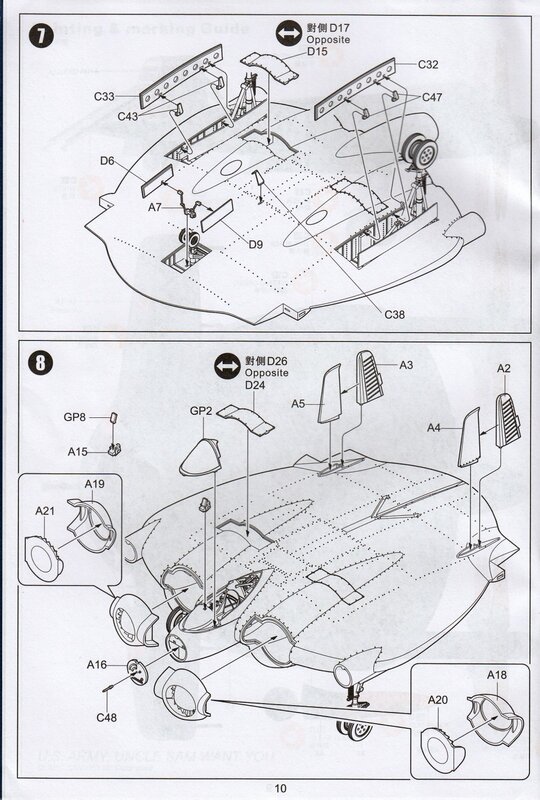 As I understand it, KH had originally intended to provide a fourth Japanese Anime inspired what-if scheme but apparently the licensing details could not be agreed prior to the kits release and this option was scrapped from the kit (and decal sheet). 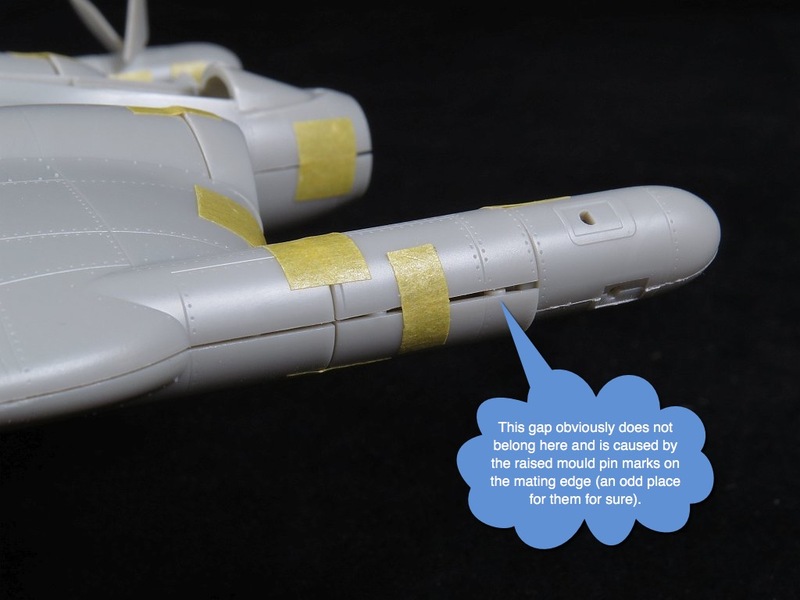 Kitty Hawk provide a total of 3 marking schemes in the kit. 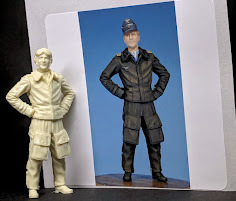 Of these, only one attempts in any way to accurately depict the two airframes built by Vought, one was to be used for static testing while the second would be used for flight evaluation. US Navy Midnight Blue - reflects the overall paint scheme used on the two evaluation aircraft. US Navy Silver - a what-if natural metal scheme. 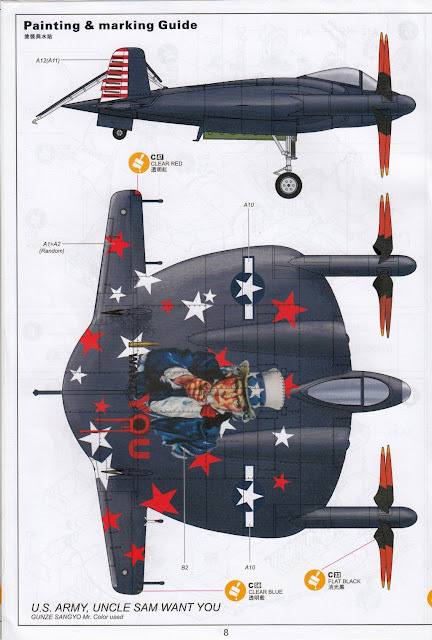 US Army, Uncle Sam Want You - a "what-if" US patriotic scheme. 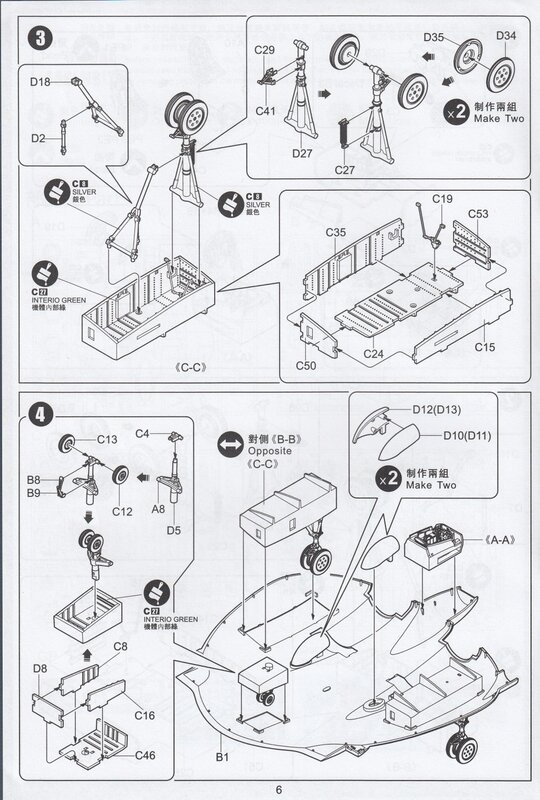 The assembly instructions are provided in a 12-page stapled booklet format. 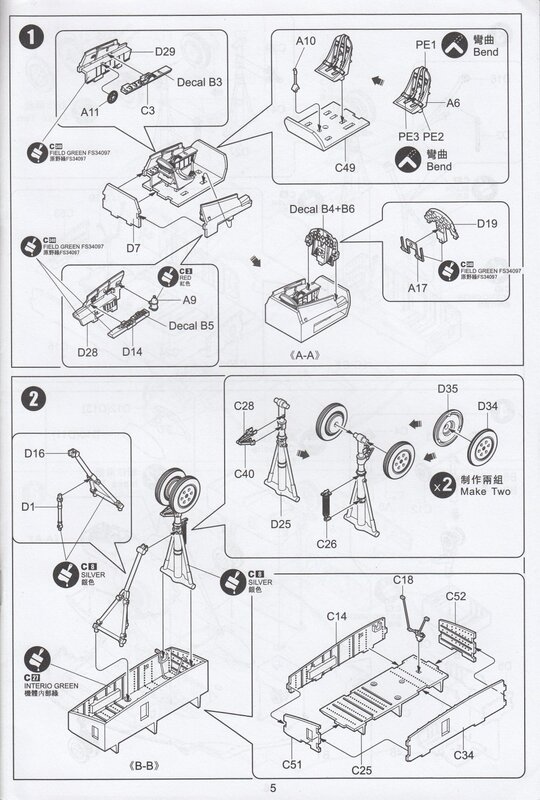 The instructions are printed clearly and are well engineered with exploding schematics explaining the suggested assembly sequence of each sub assembly. 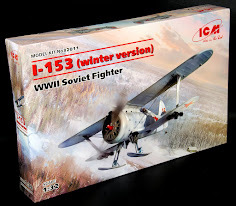 So, here we have another interesting subject to add to the rapidly growing KittyHawk stable. 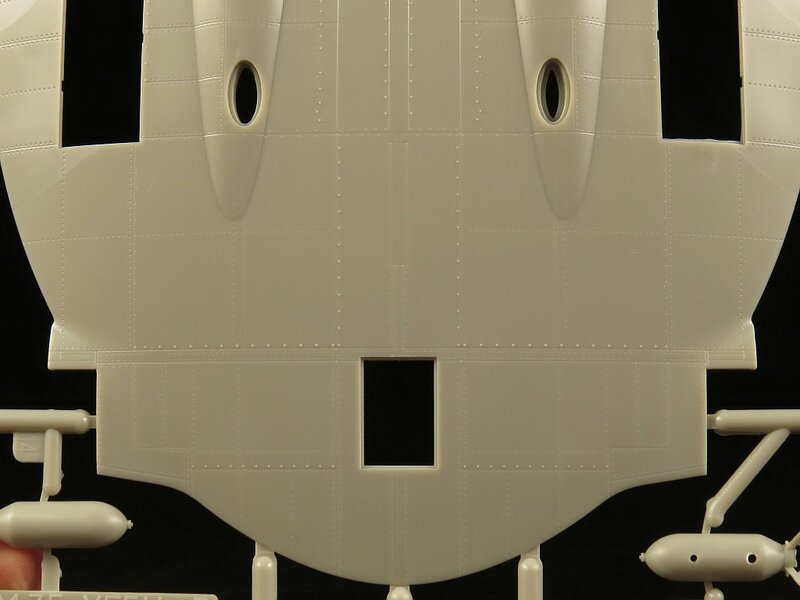 I doubt this model will appeal to many in the mainstream modelling community but if the subject does interest or motivate you then you should buy the KH kit with confidence that with a minimum of effort (certainly compared to many of KH's earlier kits) you will be able to create an accurate replica of one of the more unusual aviation experimental aircraft.